Reach a large audience base with a responsive website that looks equally appealing on smart screens too like smart-phones and tablets. And this will be made possible by Nano It World with its highly effective responsive theme creations services. 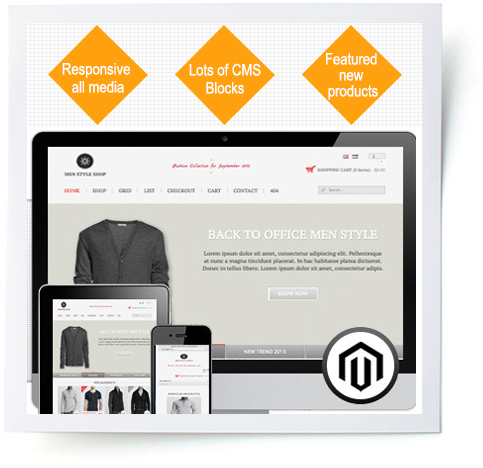 By converting site into Magento responsive, we ensure clients to get a flourishing business growth. Experienced developers at Nano It World design responsive e-shops which are compatible with computing and mobile devices. We offer Magento websites adaptable with divergent screen sizes. We scale to fit any browser width and screen resolutions. It will look equally impressive on both small screens and wide desktop screens. Nano It World offers state-of-the-art responsive theme creation and mobile marketing services. High-quality services offered by the company enable clients to get access to the booming mobile internet market. The team at Nano It World works closely with clients to understand their requirements, goals and challenges in digital market and comes out with customizes and unique solutions with a clear roadmap to success. While designing the responsive themes, the designers take care of everything that effects quality of website. Some of the factors include content quality, content placement, colour and themes and SEO optimization.